There is no doubt that it is from the Windows Store where you are able to get the necessary apps and other stuff. This is particularly true in case you are using the latest Windows OSs including Windows 10. However, accessing the store can sometimes be embarrassing with error messages like error code: 0x8024001e comes up on your computer screen. This error is not limited to the latest Windows operating systems; you can also encounter the error with the earlier versions although in different ways. Error code 0x8024001e is a Windows Update error. It makes it difficult for your computer to install or update app such as Mail app. The app simply fails to sync. It also affects your computer’s performance, making it run slow, and the operating system can easily crash. Missing or corrupt DLL files. Missing or corrupt registry key. Extra data in app cache. 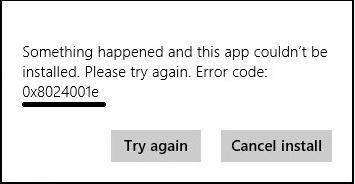 Though these are the most common reasons for error 0x8024001e in Windows app store or while updating windows, But the error is not limited to only these reasons; It can be caused because of several other reasons too. There are several methods you can adopt to resolve error 0x8024001e. While some are very simple, others are advanced are require that you have administrative rights to a computer with the error. Windows error code 0x8024001e can occur because of a minor issue that you can overlook. It is, therefore, important to ensure that your Internet connection is reliable. You also need to check whether or not your regional settings including date and time is correct. You need to restart your computer to see whether or not performing this basic housekeeping resolves the problem. The simple act of clearing Windows Store cache can easily resolve error 0x8024001e. Stored cache reduces your computer’s performance, which can lead to various issues including this error. 1. Press the combination of Win + R key to open dialogue box. 2. Type “WSReset.exe” in the box before hitting Enter. 3: A command prompt window will pop up and immediately, Store will open up. 4: Now, Restart your computer to see whether or not this resolves the issue. This method works to resolve the error in a case where corrupt registry key is responsible. Running the repair tool automatically finds and repairs any corrupt entries. The process can take some time, and it is only appropriate that you let it complete. Although the following procedure applies to Windows 8 OS, it should give you an idea on how to go about doing the same with any other Windows OS. Type “Advanced” in the start search screen to open search results. Click “Advanced Startup Options” to open general settings screen. Click “Restart now” at the bottom to restart your computer in advanced startup mode. Click the “Troubleshoot” button before clicking the “Advanced Options” button. Click “Automatic Repair” to automatically reboot your computer. Click on the administrator account to use after rebooting of your computer. The in-built automatic repair tool should begin to run, which should resolve the Windows store 0x8024001e error. The Windows 0x8024001e error can be caused by something as simple as Microsoft Update service that has stopped. Restarting the service easily resolves the error. Type “Run” in the search box before hitting Enter Or Press Win + R Keys together. Type “services.msc” before hitting Enter. Right-click “Windows Update” before clicking “Start”. This action should start the service in case it had stopped. Restart your computer and check if the error 0x8024001e is gone. Because it can be that Microsoft Update service is running, it becomes necessary to rename the software distribution folder in an attempt to resolve the issue. Step 2: Type “Run” in the search box before hitting Enter. Step 3: Type “services.msc” before hitting Enter. Step 4: Right-click “Windows Update” before clicking “Stop”. Step 5: Rename software distribution folder by navigating to C:\Windows, Right-click on “Software Distribution” folder > click “Rename” > type “SoftwareDistribution.old” before hitting Enter. Step 6: Repeat steps 1-4 to restart Windows Update service. Step 7: Restart your computer to see whether or not this resolves the problem. Lot of users have reported simply renaming the folder has solved error 0x8024001e of them, We recommend to try this method and see by yourself if this helps you or not. It may be necessary to restore your computer system to an earlier date in case any of the above methods does not resolve the problem. 1. Click “Start” >All Programs >Accessories >System Tools >System Restore. 2. Select to restore your computer to a date it worked well in the dialogue box that appears before clicking “Next”. 3. Click “Next” again in the resultant confirmation box. The automatic system restore should begin to run and restart your computer on completion. This should most probably Guarantees to fix 0x8024001e error. This method may be your last option instead of performing the fresh installation of the OS. You can easily un-install built-in apps and re-install them again to get fresh app files. Although the following procedure applies for Windows 10 OS, it should give you an idea on how to do it with any other Windows OS. Type and run "Get-AppxPackage", which displays all built-in apps. Type and run "Get-AppxPackage-AllUsers I Remove-AppxPackage" to remove all the apps. Note that you can also choose to remove an individual app. For instance, removing the Sports app requires you to type and run "Get-appxpackage-bingsports I Remove-appxpackage". You will need to download either all the uninstalled apps or an individual app from Windows Store. Simply, Reinstalling the app can help you to get rid of the code 0x8024001e. This will no doubt be your last option although it can be time-consuming. It may be your only option in case any of the above methods fail because the error is most likely caused by a combination of issues that extend to the OS. A clever way to prevent errors associated with Windows Update Store including error 0x8024001e is to install all updates including app updates whenever they become available. You also need to consider resetting the app cache before you undertake any download from the store.